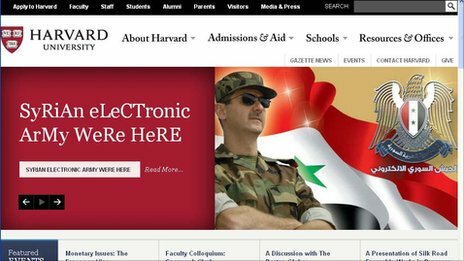 Syrian hackers have hit the website of Harvard University, one of America’s top universities, Itar-tass reports. Along with a picture of Syrian president, Bashar al-Assad, the hacked home page showed a message saying the "Syrian Electronic Army Were Here". "The university's homepage was compromised by an outside party this morning. We took down the site for several hours in order to restore it. The attack appears to have been the work of a sophisticated individual or group," said a Harvard spokesman. They also criticized US policy towards President Assad`s regime and wrote several threats to the US. The new design stayed on the website for nearly an hour.